Known for their ice creams, I recommend this café purely based on my childhood memories. Why you wonder? I actually had ice cream here on and off throughout my childhood. I recall Sicilian Sidewalk Cafe when I was still in junior school, my aunt would treat my cousins and I to their desserts in the summer. We probably visited only a handful of times when I was younger but it makes me reminisce a bit when I pass by the café. It’s still as popular as ever though, especially in the summer time. They have a patio so customers can relax and enjoy themselves. Unfortunately, I don’t have any pictures since my last visit was before I even started Toronto Foodie! However, I will for sure try to stop by the café should I find the time to venture out to their area again. Dress code: casual, suitable for everyone…even your boss if you think its appropriate. No dinner but lunches and after work would be a nice time to visit. This pastry shop is located inside a building at distillery district. Its very casual, sometimes they put out tables and chairs in front of their shop..in a hallway kind of. Its not really a sit down pastry shop, more grab and go. Good place to visit if you happen to be at distillery district for an event. I usually order their macaroons, which cost $20 for a dozen I think. It’s soft and not too chewy. I love their flavours in chocolate, strawberry and cafe moca especially. 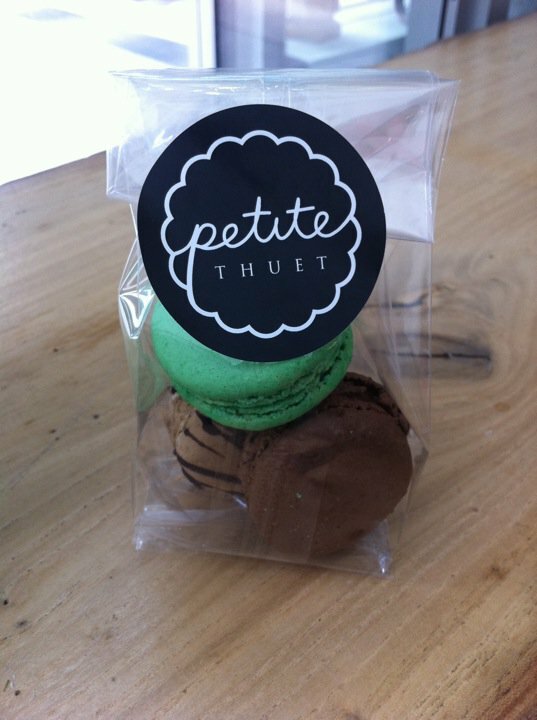 Check them out, they added some new flavours and even offer monogramming services! They sell sandwiches, cupcakes, cakes, cookies and other desserts with some vegan and gluten free options. They cater and do personal cakes. See website for more details on their services. I solely visit this place for their macarons, which cost $2 and actually taste better then some of the more expensive shops I have visited. I’m giving a conservative rating till I try something else. They sell sandwiches, bottled drinks and some pastries. The shop has glass windows from top to bottom and the layout is somewhat minimalist. Great for lunches with coworkers or friends. Possibly acceptable for work meetings too. Locations: There are 2 other locations but I went to this one. MoRoCo, is a Yorkville boutique that sells chocolate confections and desserts. As expected, MoRoCo lives up to the luxury expectations of a Yorkville boutique and costs for desserts are expensive. They have a lounge area that I am very curious to dine in, it is decorated with purple, white and black furnishings. The walls are painted dark purple. Very pretty. MoRoCo’s lounge only has a menu’s for afternoon tea, brunch, a la carte and cocktails. It’s not a place to eat dinner but to have lunches and drinks. The most substantial item on the menu is steak & eggs (2 eggs w/ AAA centre cut striploin) and it costs $21. I find things here to be very expensive but people are probably attracted to it because they want the experience. 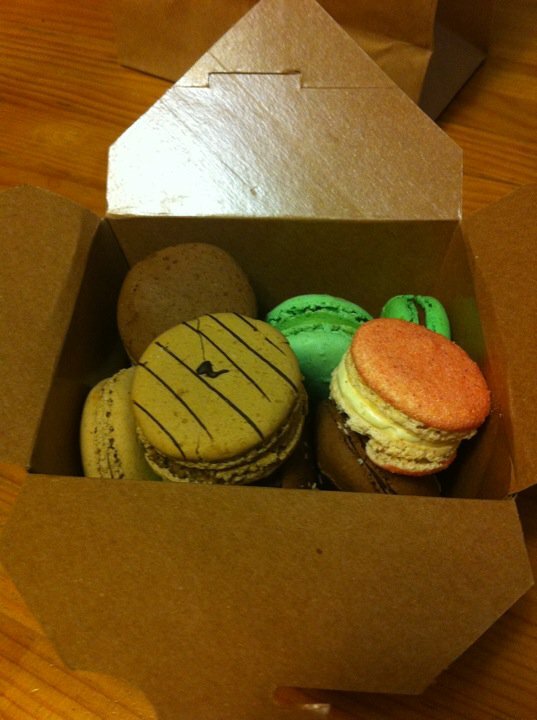 I have only ordered their macaroons, I think it was 4 for $10 – that’s $2.50 per macaroon. They tasted alright, much more chewy then ones at The Sweet Escape Pastisserie. While, hot chocolate…REAL hot chocolate costs around $7-8. I would probably go here to take a break from shopping with my friends or to have a little afternoon tea.